As heads of the Shin Bet (the Israeli Security Agency), the six interviewees who narrate this movie stayed behind the scenes, providing their country with an unseen shield. One of them looks like a jolly grandfather in suspenders. Another has a youthful presence, but shares the reflections of a man much older. Another, with scratchy voice and chiseled face quotes intellectuals like Hannah Arendt and Carl von Clausewitz. Now, for the first time, they make themselves visible, speaking out with surprising frankness in the most dramatic political documentary in years, especially for anyone with a stake in the Israeli-Palestinian conflict. The viewer need not have familiarity with the modern history of the Middle East to understand the film. Its first lesson is that in tracking and targeting terrorists, politicians want black-and-white answers, while these intelligence officers usually inhabit in the grey of doubt. If they strike, they might kill civilians. If they do not strike, they might leave Israel vulnerable to an assault. But, if they give their heads of state the "wrong" answers, they risk widespread humiliation. Thus, public perception might be valued more than Palestinian lives. And the film offers a second lesson, which is that this godlike power to kill is unnatural. 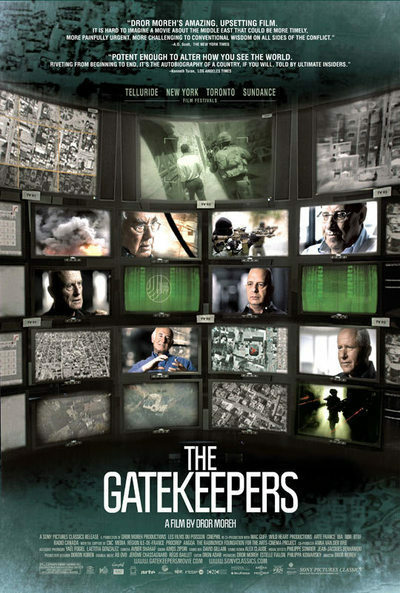 "The Gatekeepers" has a cold air to it: washed-out colors, tan ominous soundtrack, eerily floating satellite footage… The most chilling aspect, however, is the blunt commentary about the work itself. These men accept that national security has no morality Their expeditions into Palestinian neighborhoods are exercises in hunting rabbits. One officer comments, with a slight grin, that in Nablus, "wherever you threw a rock, there was either a cat or a terrorist. Some nights we arrested hundreds of people." The film's atmosphere is compelling, and another strength is that it is self-critical. These officers offer candid observations, not only assessing the politicians they served, but also their own predecessors' mishandling of famous events. More than that, they acknowledge that the Palestinians have a opposing narrative. One official expresses his difficulty in sitting with terrorists for peace talks, but recalls that the Palestinian at that table called him a terrorist. Thus, he states, one man's terrorist is another man's freedom fighter. The security overlords recount how, over the years, Israel wanted peace, but received more terror, while the Palestinians wanted a state, but received more settlers. This film is not the usual chronicle of Israeli victimization at the hands of Palestinians savages. Rather, it explores what Israel can do, and needs to do, to achieve a lasting peace and stability. In this otherwise emotionally sterile film, the most dramatic discussions involve the rise of the right wing among the Israeli settlers in the occupied territories. Their proliferation and increasing hostility, and the slap-on-the-wrist punishments they received, were an open secret, but their rage was unleashed with the Oslo Accords. The officers launch the most surprising criticism, against Benjamin Netanyahu, all but blaming him for inciting the killing of Yitzhak Rabin, whose murder by a far-right Israeli extremist changed the way these officers looked at their nation. All it took was one punk with a gun to derail the peace process. After that, the Shin Bet changed its strategies, quietly working with Palestinian officers on security matters. But the Palestinians do not cooperate just to help Israeli security, but because they legitimately believe they will soon have a state of their own. Each time they fail to stop violence, their dreams of a state remain unfulfilled. Naturally, in such a film, we have to ask whom to believe. This documentary might present an unprecedented look into Israeli intelligence. Or, in contrast, it might itself be part of an psy ops campaign, presenting these figures as men with moral consciences; by extension, the Shin Bet might seem far more civil than it is. And, such a film will earn many detractors for lack of balance. Some will complain that "The Gatekeepers" does not go far enough, that the Shin Bet here minimizes its crimes, especially when asserting that they do not torture, that their prisoners die instead from "shaken baby syndrome." Others will complain that it is too critical of the Israeli right wing. In any case, the film presents the history through an Israeli narrative of events, starting from its depiction of the Six Day War, to the rise of Hamas and Islamic Jihad. That it also speaks about the rise of the Jewish extremists, positions its outlook on the political left. And, that is the point: These officers speak as some of the key men in the Israeli state apparatus. Their job is neither to pontificate, nor to analyze historical causes and consequences. Rather, they are soldiers with clear assignments. Having stepped down from their positions, they now believe that the dominant tale, that the Israeli-Palestinian conflict will end only with the annihilation of one or the other, is dead wrong. The film makes explicit and implicit endorsements. The strategy of vengeance and overkill is ineffective and leads Israel to horrific behavior described only through metaphor. Further, the killing of extremists will not end terrorism and will definitely not produce moderation. Israelis must be ready for talks with anyone who will talk. And strategic partnerships will always be necessary to combat violence. In that way, this film is the most pro-Israeli film I have seen, because it is the most practical. In recognizing Palestinian points of view (though without endorsing them), it sees Palestinian self-determination as synonymous with Israeli peace. Thus, this film is also, unexpectedly, the most hopeful film I have seen on the subject.